Have a question? Want to visit? Please contact us! 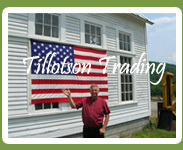 Tillotson Trading is usually open Monday through Friday 8am to 4pm and Saturday 10am to 2pm. If you have need for doors or hardware, it is best to make sure Steve will be in the shop that day. 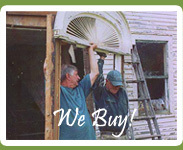 Just give us a call (802) 439-6537. We check email as frequently as we can, but for fast service please call. Below are directions from the North (Burlington area) and from the South (White River Junction). Thank you for visiting our website. We look forward to meeting you! Take I-89 South – 38.1 miles, take Exit 7 to merge onto VT-62 E toward Berlin/Barre/US-302 – 4.9 miles, turn right at N. Main St./US-302 – 11.1 miles, turn right at Route 25 – 7.2 miles to 10086 VT Rte. 25. We have a large set of buildings on the left with cupola, white house with new porches across front stacked with inventory, a new showroom with green siding and reddish boards surrounding the entrance, a sign above the porch of the white building, and a large ANTIQUE sign near the road. Take I-91 North – 25.3 miles, take Exit 16 to Bradford - .3 miles, turn left onto Waits River Road/VT Route 25 North – 9.5 miles to 10086 VT Rte. 25. We have a large set of buildings on right with cupola, round window in end of building, a new showroom with green siding and reddish boards surrounding the entrance, a white house with new porches across front stacked with inventory, a sign above the porch, and a large ANTIQUE sign near the road.